Eli and Living Barbie Dolls from Japan Market (1970) Same packaging. Eli wore Red leotard and tights and Barbie wore pink. 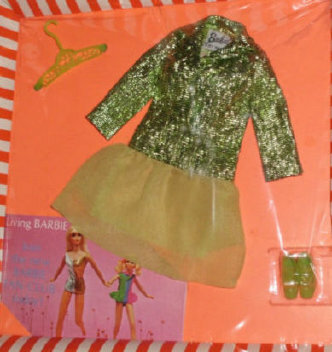 In 1970 the #11188 Dramatic Living Barbie doll was released exclusively in Japan. She looks similar to the U.S. Version of the Dramatic Living Barbie. The Japanese version was marked “made in Japan” and the U.S. Dramatic Living Barbie dolls were all marked “made in Taiwan” with one exception; the doll from the Sears exclusive #1585 Living Barbie Action Accents gift set. She was made in Japan as well. Barbie had red straight hair which is slightly longer than the U.S. version doll. She had side glance eyes, and wore a pink leotard with matching tights. She was packaged in an open faced box which included a clear “X” stand. Some of these dolls had a wrist tag, and others did not. Even though she was released in 1970, her box is marked 1969. Barbie’s friend Living Eli was also introduced the same year. She had dark hair with bangs and two side ponytails tied with blue hair ribbons. She wore the same leotard and tights as Barbie, but hers were a red color. She had the same body as Dramatic Living Barbie. The face mode that was used for Eli was different. Her face mold was that of the Sweet Sixteen Barbie from the U.S. market, only painted differently. She came in the similar open faced box with clear stand as Barbie. Both the Japanese Dramatic Living Barbie doll and her friend Living Eli dolls are extremely hard dolls to find on the secondary market, and when they are available, it’s usually at a premium price.